There are many interactions between noncommutative algebra and representation theory on the one hand and classical algebraic geometry on the other, with important applications in both directions. The aim of this book is to provide a comprehensive introduction to some of the most significant topics in this area, including noncommutative projective algebraic geometry, deformation theory, symplectic reflection algebras, and noncommutative resolutions of singularities. 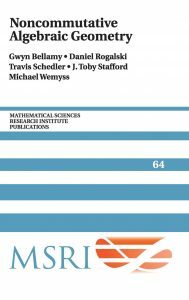 The book is based on lecture courses in noncommutative algebraic geometry given by the authors at a Summer Graduate School at the Mathematical Sciences Research Institute, California in 2012 and, as such, is suitable for advanced graduate students and those undertaking early post-doctorate research. In keeping with the lectures on which the book is based, a large number of exercises are provided, for which partial solutions are included.